Excellent Q2 earnings. With 404 S&P 500 Index companies having reported second quarter 2018 earnings results, a solid 79% have exceeded earnings targets, delivering robust 23.5% year-over-year growth on a nearly 3% upside surprise. Revenue growth of 9.2% is a solid 1.1% above expectations as of quarter end. Though the amount of earnings upside is typical, at this stage of the earnings cycle amid high expectations and potential margin pressures, we consider this an excellent result. Tariffs having little impact on overall earnings guidance. Forward four quarter estimates have impressively risen 0.6% during reporting season with over 80% of results in, breaking the historical pattern of 2-3% declines. The resilience of analysts’ estimates with less than 100 S&P 500 constituents left to report (47 coming this week) suggests tariffs have had little broad impact on companies’ outlooks. S&P 500 on its hottest streak of the year. The S&P 500 capped its fifth straight positive week on Friday, the first such streak since the week ending Dec. 22, 2017. Five-week winning streaks are a rare feat of strength for the S&P 500: the index has posted 8 five-week winning streaks since February 2013 (and five 6-week winning streaks over that same period). The S&P 500 gained 0.8% amid a busy week for investors as several major central banks (including the Fed) held monetary policy meetings, 141 S&P 500 companies reported earnings, and new developments arose in the U.S.-China trade skirmish. Investors will have fewer catalysts to trade on this week so six straight weeks of gains may be elusive, but overall, we still expect continued strength in U.S. equities through the rest of the year. Light economic calendar this week. Wednesday’s oil inventory reports will be on investors’ radars, along with U.S. consumer and producer inflation later in the week. 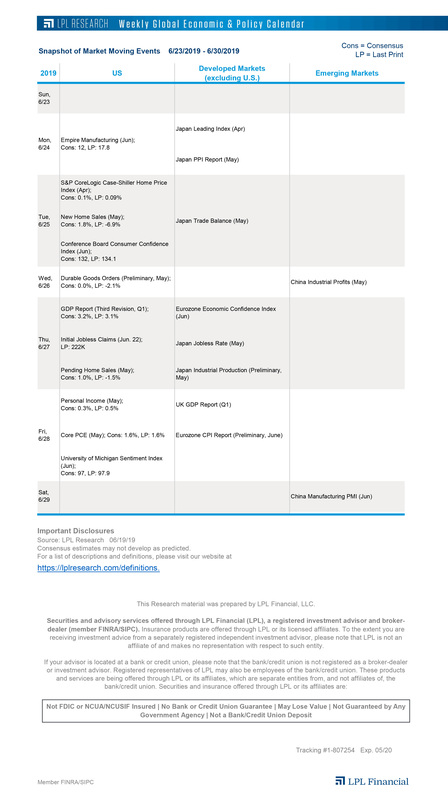 Overseas, China’s trade balance figures and foreign reserves will be worth monitoring, but the global docket includes other important indicators, which you can access on our Weekly Global Economic & Policy Calendar. Focus FAQs. Last week we had the pleasure of joining about 4,000 LPL advisors at our Focus 2018 national conference in Boston. Many of you reading this were likely among them. The conference is an excellent opportunity for us in the LPL Research department to interact directly with our clients, and gives our advisors a chance to ask us questions about the markets. In this week’s Weekly Market Commentary, we share the most frequently asked questions from Focus 2018, covering such topics as trade, emerging markets, and growth/value. Payrolls miss estimates, but job market tightening still evident. July payrolls were softer than consensus estimates, but the underlying forces of the U.S. job market show a continuation of tightening we’ve seen as the economic cycle has matured. In this week’s Weekly Economic Commentary, we break down the July jobs report and analyze the implications of the current labor market on the U.S. economy and future monetary policy. LPL Research podcast for everyone! Chief Investment Strategist John Lynch and Senior Market Strategist Ryan Detrick recorded two podcasts last week at LPL’s Focus conference, the first in a new series that will be accessible to the public. Everyone can access Monday’s recording here and Tuesday’s recording here.